Team Five put out a call for questions. Here’s what we want to know. Hearthstone game director Ben Brode and game designer Dean Ayala are hosting a special livestream Q and A tomorrow where they’ll take questions from players and addressing the design of the game and other issues. The communication of the Hearthstone team is constantly compared, unfavorably, to that of other games like Overwatch. This livestream appears to be an admirable attempt to address those complaints. Brode and Ayala put out a call for questions—and we thought we would oblige. So here are our five questions for Ben and Dean on the future of Hearthstone. From specific features, to game modes, to the overall design philosophy of the game, it’s a wide ranging list. Will spectator mode ever be fit for an esports purpose? Hearthstone‘s spectator mode launched in December 2014, a few days before the Goblins vs Gnomes expansion. As the esports scene was exploding, it was an essential tool to stop organizers from having to run complicated screen capture setups. When it launched, however, many were baffled with how it had been implemented. When you spectated two players playing the same game, the top player’s hand was not rotated like it was in every decent esports broadcast. It was kept upside down, as if you were watching the game across a table where the cards were face up for some reason. This has never been modified, and even Blizzard’s own esports broadcasts have to spectate both players and implement a fix. Spectator mode was also very feature light. There are no draw statistics or deck tracking, or anything else which might improve the spectator experience in-client. Once again the onus is on broadcasters to augment it themselves. This point is wrapped up in another feature mentioned later, but spectator should ideally provide everything in-game broadcasters might need. If you do that, it takes the equipment and investment required down significantly, and could really do wonders for grassroots broadcasting and events. Is “Curvestone” a desirable place for the meta to be? In an interview with IGN, senior designer Mike Donais said that the meta is “pretty healthy right now.” That is at odds with what many players are expressing, however. Even in this interview, Donais expresses some reserved concern over the influence of pirates in the meta. The early game pirate package is pretty dominant in Hearthstone right now, with Warrior, Shaman and Rogue decks all employing it. As a result, according to Donais, control decks are having to lower their curve to have something to do on those early turns. That somewhat flies in the face of the archetypal control deck, where you sacrifice having a strong early game for the bonus of a very dominant late game power spike. Instead, in response to the increased potency of very early game aggro mana curves are being smoothed out to where decks are just trying to play the stronger cards on each individual turn to gain an advantage. When decks are just trying to play the best minion on each turn for the mana cost, it’s often called “Curvestone.” Because all that matters is the mana curve of your deck. The pirate package might be the most polarized example of this yet. When your opponent can put insane amounts of power on the board on turn one, the game can often just be over then and there. Are in-client tournaments going to be a priority in the next year? This is the feature I’ve always wanted to see in Hearthstone. Imagine being able to go into the game and see a lobby of tournaments that are about to start. They are all different formats and player sizes, giving different levels of commitment. Some exclude certain sets, or legendary cards, or Reno decks. You pick one, and the game serves up your opponent when the time comes. Even better, you can spectate games in other tournaments. From casual tournaments to the latest DreamHack circuit event, you can now get into the game for yourself and examine the cards, deck and hand sizes at your leisure. If you’re an aspiring pro, this is where you would find the tournaments that give out points for the HCT circuit. No worrying if the sites are dodgy or players will try and scam you, because the game validates all the decks and results with no room for human error or mischief. So the question is, simply: please? Are there any cards you now regret printing? 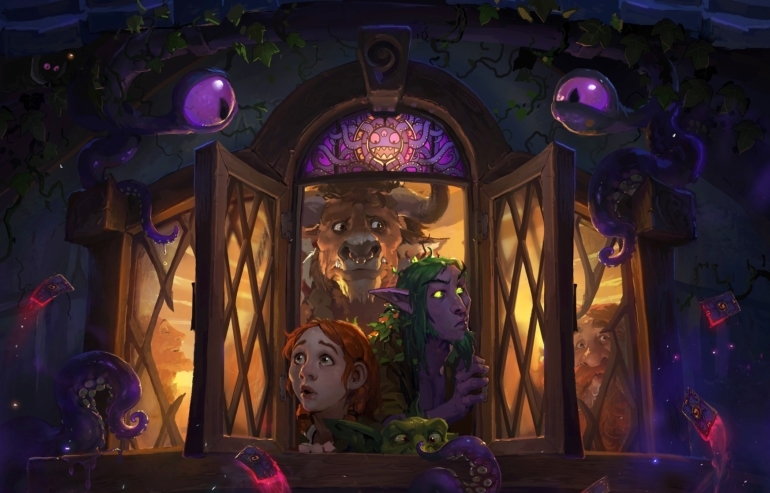 Lots of cards have come and gone in Hearthstone, from pre-nerf powerhouses to old sets now rotated out of Standard mode. Remember Mysterious Challenger? That card defined the meta for a time, as everyone was simply competing to optimize their build, Aggro Secret Paladin, or Midrange Secret Paladin. Cards don’t have to be overwhelmingly powerful to be limiting, though. One of the best examples of this is Sludge Belcher, a card which was ever-present in control decks throughout its time in the meta. If you weren’t playing Belcher there had to be a really good reason. Those dearly departed cards aside, there are some cards in the classic set that, in hindsight, I’m not sure Team Five wouldn’t want to go back and change. The classic legendaries in particular are incredibly strong. Cards like Tirion, Grommash and Antonidis continue to be strong in whatever meta game, but newly printed legendaries for those classes gain limited foothold if anything. With these incredibly strong cards already around, trying to usurp them would create cards that are too powerful—but anything weaker just won’t see play. Hindsight is 20/20. But it would be interesting to see Ben and Dean apply some, and talk about how it informs their design philosophy going forward. If you could blow it up and start again, knowing what you know now, what would ladder look like? We know the ladder system will be a big topic of discussion on the livestream. Ben Brode has spoken before about wanting to change the way the ranked play system works. Back in October he acknowledged that ladder could “feel like a grind”, saying that the team were looking at ways to adjust just about every aspect of the system. In the IGN interview, however, Mike Donais claimed that any potential changes were still quite a way off. The ladder system at the moment has big negatives for both casual players and those at the very top end. As Brode acknowledged ladder can overall feel like an unrewarding slog, with win streaks overly important to quickly climb through the early ranks. For those players at the very top, they’re jostling for position as the clock strikes midnight at the end of a given month. This is because the highest rankings give out precious HCT ranking points, and can help carry a player to the World Championship. But that system has really never been adjusted to make that less of a grind and less soul destroying, with bad matchmaking meaning that a loss to someone significantly down the ladder from you can destroy your chances. So, knowing now what the ladder is used for outside of the game itself and how the meta plays out, is there anything built into the system that Ben and Dean wish wasn’t there?